With winter on its way, it’s time to think about preparing your wardrobe for the cold. Here are the absolute must-have designer jackets for autumn and winter 2018 that will keep you weather-proof in style. What do we look for in a good winter jacket? Ideally, they should achieve a perfect balance of aesthetics and practicality. The best winter jackets are warm but breathable to help regulate body temperature. Whether the jacket is for a special occasion or an everyday item, it should suit the purpose and be wearable. And of course, you want a good winter jacket to look beautiful. When choosing the ideal winter jacket for you, above all other factors are your individual preferences. You may like particular styles and brands, or you may focus more on details like pockets or a fur-lined hood. That is why we have compiled this list of the most attractive and functional new winter jackets for this season. This reversible down-filled jacket by Emporio Armani is a fantastic winter coat from the latest Autumn/Winter 2018 collection. The playfully stylish coat is reversible, with one black and one metallic silver side that can both be worn on the exterior. 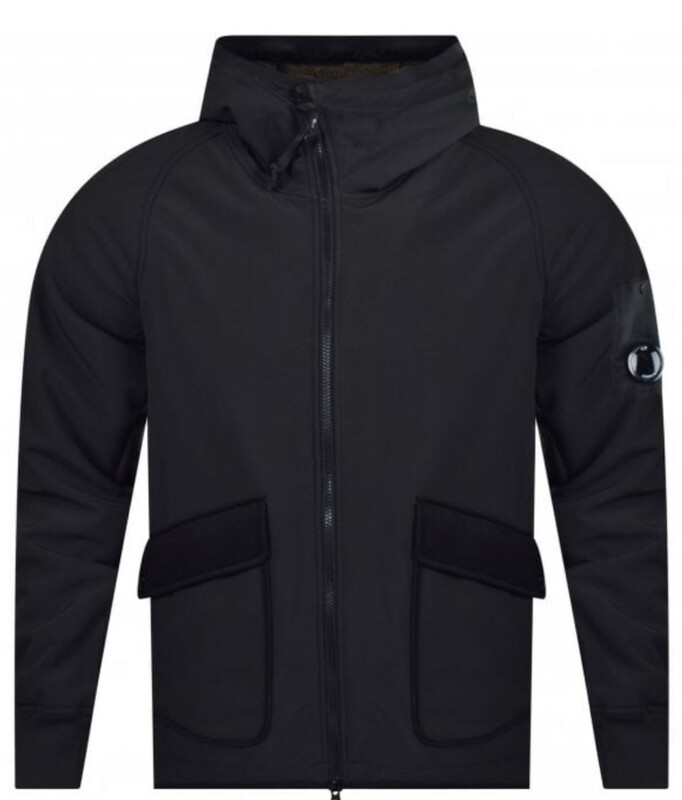 The down jacket features two zipped side pockets (on each side) and the Armani logo patch on the arms. If you’re looking for a versatile, modern winter coat with character that is sure to keep you warm, this one will do the job. If anyone is an outerwear expert it’s Mackage, the designer brand whose elements always come together for a perfect combination of practicality and style. This Dixon bomber jacket screams luxury with its fine details, like the black leather lined napoleon pocket and two side pockets with angled zippers and flaps. 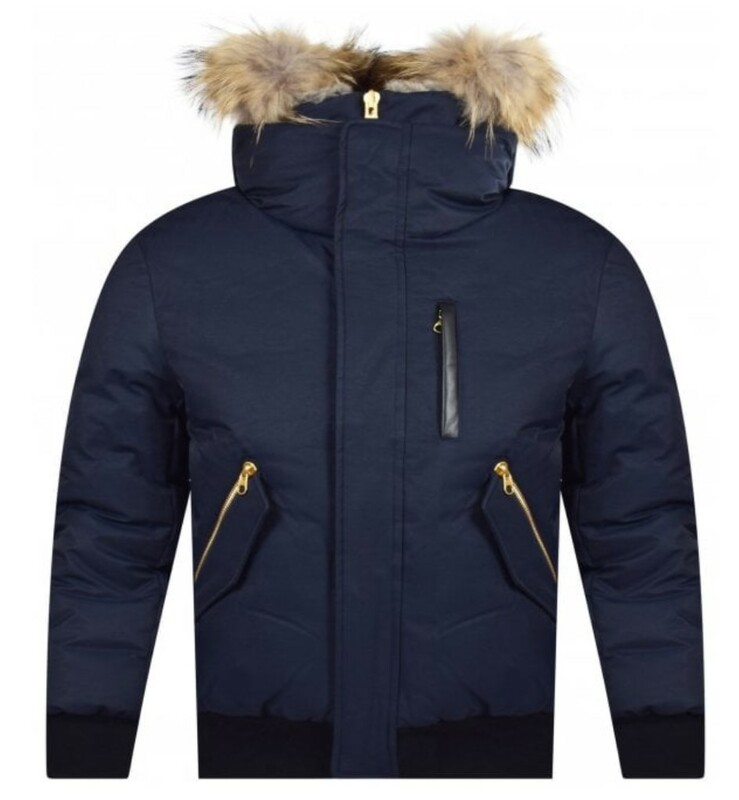 Both the gold-coloured zippers and light-coloured fur create contrast against the navy blue coat, allowing the thoughtful details to stand out. This jacket is designed by the Canadian brand familiar with icy winters, and this is evident. 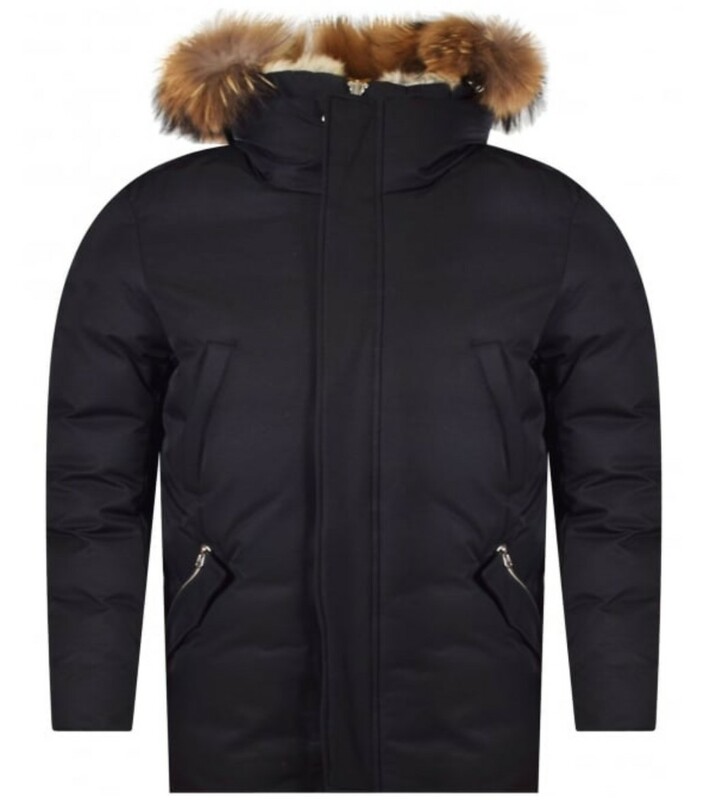 The coat is filled with heavyweight down, and also features a removable hood with fur lining. Furthermore, the cuffs are crafted in ribbed knit to make sure to keep the heat in and the cold out. If you’re looking for a high-end jacket crafted to look and feel great throughout the winter, you can rely on the Mackage Dixon bomber. Varsity jackets are the descendants of letter sweaters, which were first introduced by Harvard in 1865. This type of college attire has always had a lot to say about its wearer, usually through patches and other details marking individual achievements at college. This dragon-embroidered varsity jacket by Kenzo recalls this originally American tradition in its own lively way. It features a variety of colourful patches, including logo pieces on the front and sleeves and an oversized colourful embroidered dragon on the back. The eye-catching dragon is a real work of art, and made of over 320,000 meticulous stitches. The body of the jacket is crafted from a high-quality wool and nylon blend, while the sleeves are made of durable white leather. The coat is complete with a press-stud fastening down the front, slanted pockets, and elasticated striped collar, sleeves, and hem. This vibrant design manages to be a perfect combination of bold and practical, making it an excellent choice for a winter jacket this season. We believe this fleece-lined hooded jacket by C.P. Company might just become your new favourite this winter. The sleek design is minimal, yet sophisticated. The jacket is very comfortable, with ribbed cuffs to keep you toasty. The jacket features a full front zipper, two slanted flap pockets on the front, and an interior pocket. You can find the signature C.P. Company goggle lens brand on the arm. All in all, this high-quality item is an excellent choice if you’re looking for something you will want to wear every day. Get the C.P. Company fleece-lined jacket now for £350. Also available in khaki. This luxury winter jacket by Givenchy is designed with expert attention to the fine details. The body of the coat is made of a high-quality quilted polyamide blend, while the sleeves and shoulder pads are made of luxury lamb leather. 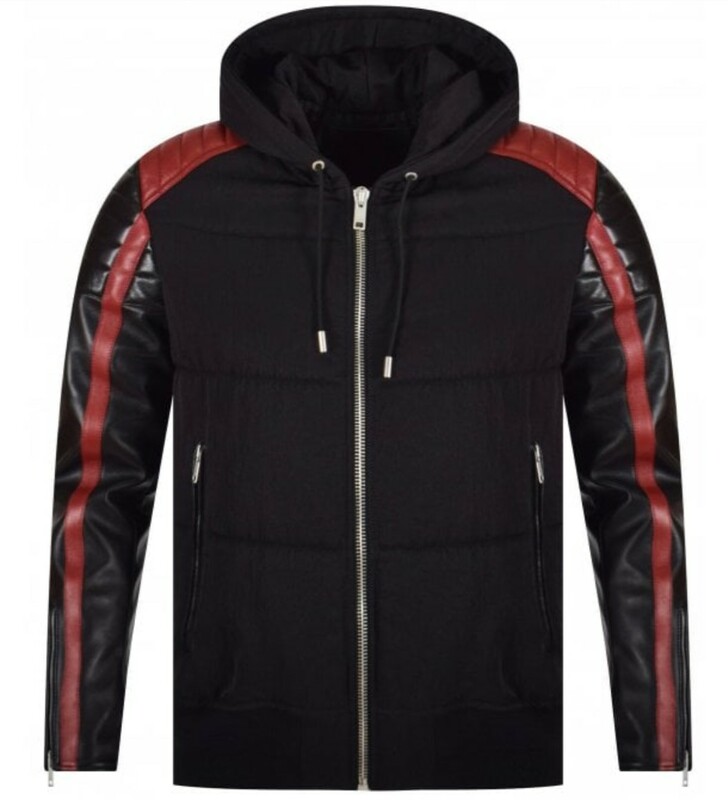 The crimson-coloured shoulder and sleeve detailing give the coat an eye-catching attractiveness, while the contrast between the matte polyamide and wet-look leather contribute sleek originality. A timeless piece, this Givenchy jacket is sure to keep you luxuriously warm this coming winter. Marcelo Burlon is an intriguing personality who travels the world as a famous party organizer, DJ, creative director, photographer, nightlife wizard, and more. His clothing line, known as County of Milan, is a rapidly growing success, and this hooded puffer jacket is from the latest collection. 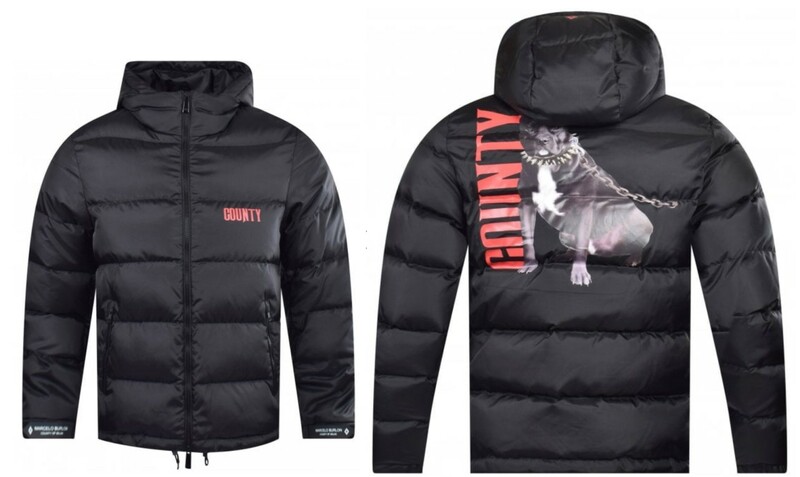 The jacket is very warm and cosy, and can only be described as bold in style, with a large print of Marcelo Burlon’s signature ‘Dogo’ logo pitbull design on the back, and a printed County logo on the front. 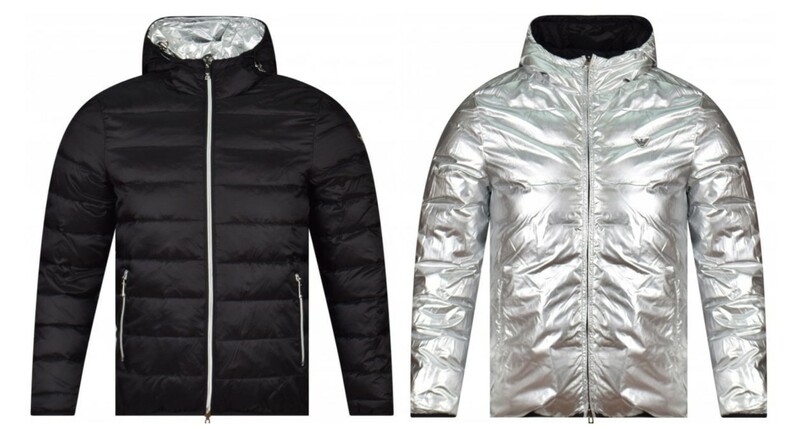 The black polyester outer has an eye-catching shimmer that makes the coat stand out even more. The jacket has everything you need, including a quilted hood, full zipper, and two side pockets. Are you looking to update your wardrobe this winter? Why not go for this classy but youthful padded jacket from Kenzo’s new collection? It features the winter essentials, including premium feather down lining and a faux-fur trim hood, as well as side pockets, an arm pocket, and fitted cuffs and hem. It comes in classic camel brown or black with a signature Kenzo logo on the arm. If you’re looking for a versatile, attractive, premium-quality winter coat at an affordable price, this is the one. Get the camel-brown Kenzo padded coat here for £600. Also available in black. Bomber jackets have been cool for a very long time, and there’s a reason for that. I mean, admit it, even the name ‘bomber jacket’ sounds cool. This timeless classic by Emporio Armani is an excellent choice for a wardrobe staple. The body is made of a polyester blend, while the sleeves are made of contrasting faux-leather. The fastening is a full concealed double-ended front zipper, similar to the zippers on the two slanted side pockets. The traditional collar, cuffs, and waistband are ribbed for comfort and style. 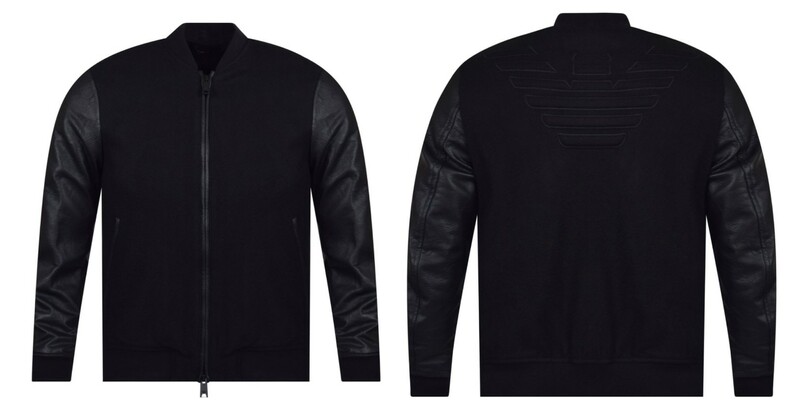 The back of the jacket features a large traditional Emporio Armani eagle logo. This design blends tradition, minimalist elegance, and high-end fashion into one must-have winter jacket. We’ve already mentioned how college-style jackets came about. This jacket by Maharishi is a unique twist on the classic. While college jackets are usually composed of different colours for the sleeves, body, and hems, this boiled wool jacket is in solid all-black colouring. The high-quality fabric is manufactured by notorious luxury wool supplier Abraham Moon in England. What really sets this jacket apart is the beautiful orange embroidery on the chest and across the back of the jacket. The embroidery features one tiger and the front and two larger tigers on the back. There is also playfully ‘censored’ logo text on the front left, and similarly ‘censored’ logo text on the back. 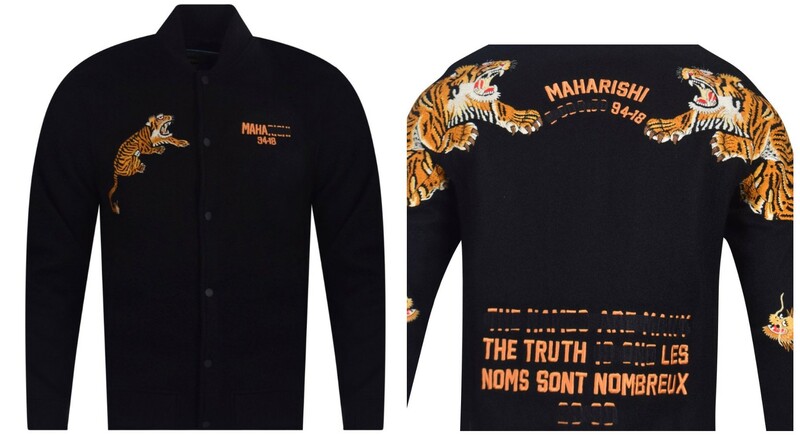 At the bottom of the reverse of the jacket, there is large bold text which is also ‘censored’, and reads ‘the names are many but the truth is one’ in English and French. This Maharishi jacket is an excellent example of a high-end twist on a timeless classic, and is a versatile jacket for this winter. This white padded jacket by True Religion is from the latest 2018 autumn/winter collection. 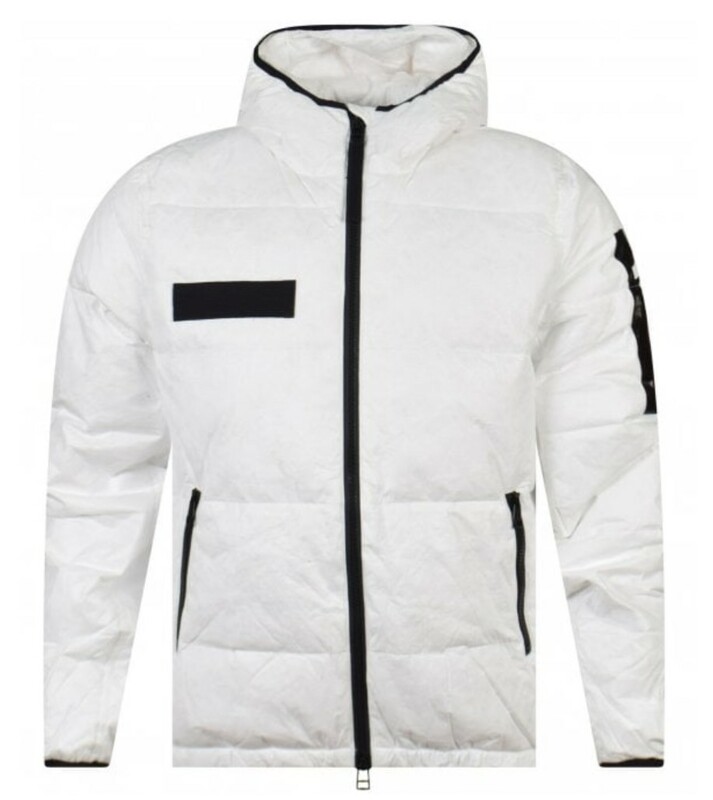 The polyester and nylon jacket stands out thanks to the contrast between the white body of the coat and the black details. These include the full frontal zip closure, stand up collar with black lining detail, black right breast pocket strip, and large black true religion logo on the left arm. With a large hood and elasticated sleeves and hem, the jacket is made to withstand cold weather. If you’re looking for a highly functional winter coat that stands out in style without breaking the bank, the True Religion white padded jacket is a great choice. If you’re like me, one of the things you hate about winter is the lack of light and colour. 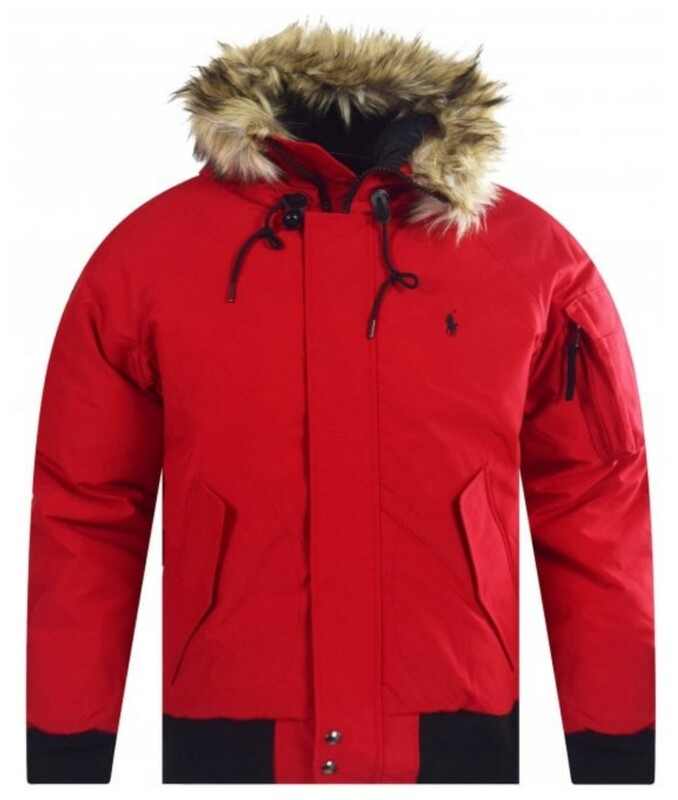 But with this red winter bomber jacket from renowned designer Polo Ralph Lauren, you’ll bring the brightness back to winter. This men’s coat is from the latest Polo Ralph Lauren AW18 collection. It has a great range of features to withstand all weather conditions. Its outer is wind-resistant and water-repellent, while the inside is filled with ultra-insulating goose down. The removable, adjustable hood is lined with faux fur to keep the elements from your face. The black elasticated waistband and sleeves provide warmth and striking contrast with the red body. The jacket has three pockets, including two flap pockets on the front and a zip pocket on the left arm. Finally, the chest features Ralph Lauren’s classic polo player branding. If you’re looking for an eye-catching winter jacket that will get you through any weather, The Polo Ralph Lauren red bomber jacket is perfect. Last but not least, we present you with this fur hooded parka jacket from the designer outerwear experts at Mackage. The ‘Edward’ parka was thoroughly tested in laboratories and real Canadian winters. It is crafted to withstand harsh winter temperatures up to -35 degrees Celsius. 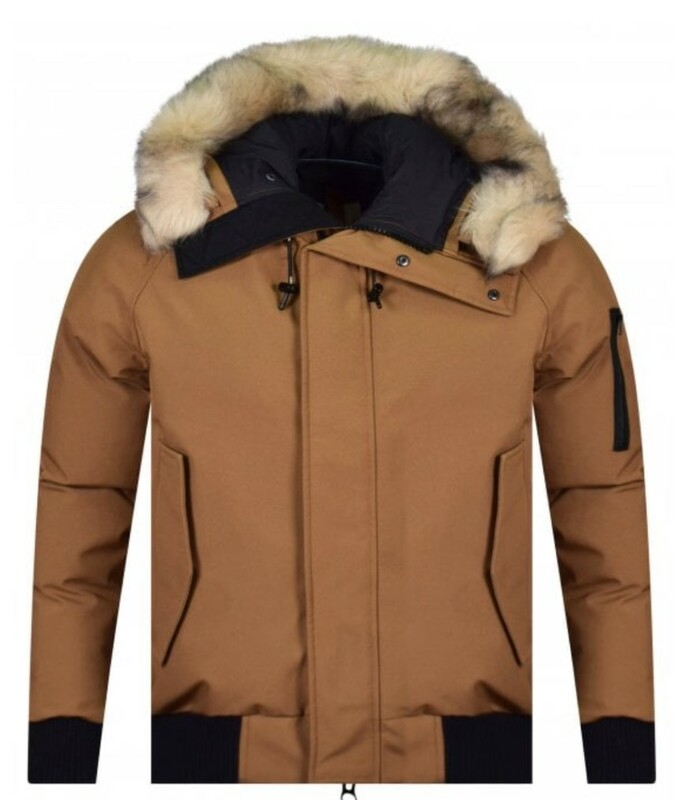 The hood features raccoon fur on the outside as well as highly insulating fur lining on the inside, while the collar is lined with soft sheepskin for added warmth. The hood and lining are removable so you can adjust the jacket to suit your preference. The parka further features four insulated front pockets, wool-knit arm cuffs, and ventilation eyelets inside the arms for breathability. You can trust that Mackage experts have thought of everything when it comes to the details, and that this beautiful parka will keep you warm and dry no matter the weather.